Not much time for sharing project ideas… hopefully there will be more time for that, after the Holidays are over. 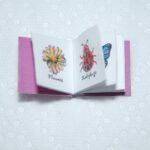 However, one thing we HAVE done, is make a teeny tiny Fairy Christmas card for our neighbour, from her first set of fairies, Petal and Thorn. We want to take this opportunity to thank everyone who visited our site, all our customers, and everyone who has someone who “believes”! Merry Christmas, and all the best for a happy and healthy 2016! So, one day Petal Willowbug got the biggest surprise! 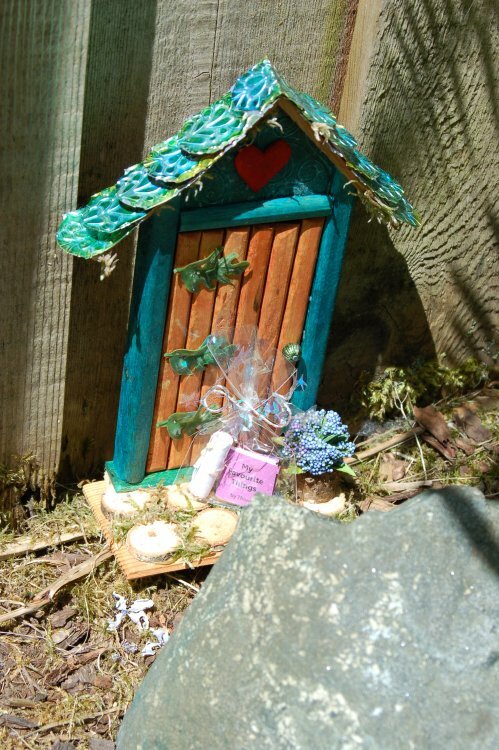 A gift was waiting at the fairy door for her. 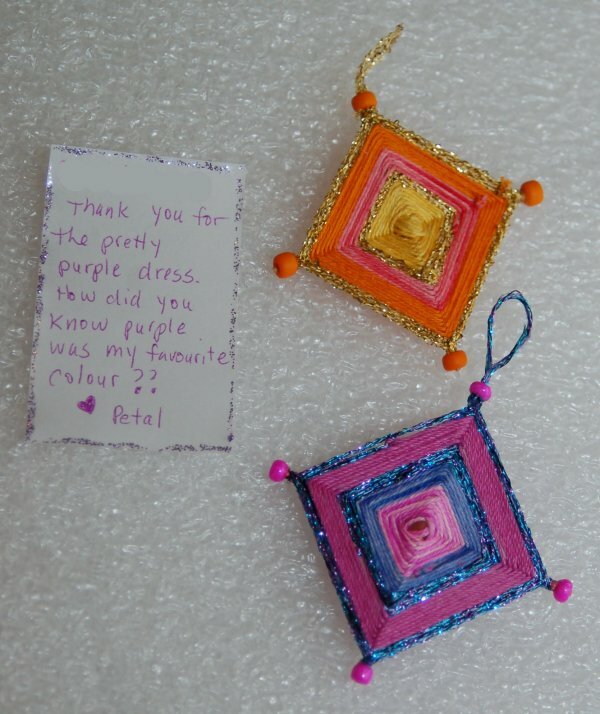 But not from the little girl next door – from her brother! He made her a fairy-ly “free form” little dress out of purple felt. Really too adorable for words. In return, Petal and Thorn made them each a little God’s Eye. We forgot to put a penny in the picture for scale, but they were not much more than an inch square. I’m sure most of you made one of these in grade school at some point. If not, here’s a pretty good tutorial on the basics. Because they were so small I used embroidery cotton instead of yarn… and sparkly embroidery cotton looks SO much like Fairies made it! And mine were made with toothpicks instead of popsicle sticks. It was pretty finicky, but worth it in the end! 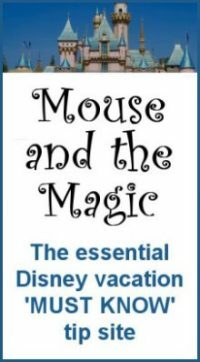 Have fun and keep the magic alive! 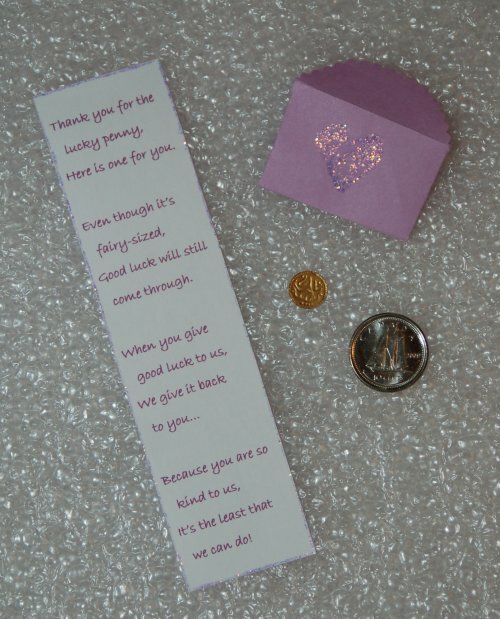 Today’s post is not really a ‘project’ for you, but a quick note on finding inspiration and magic in everyday items… which turned into something Petal and Thorn “dropped off” for our little neighbor, recently. 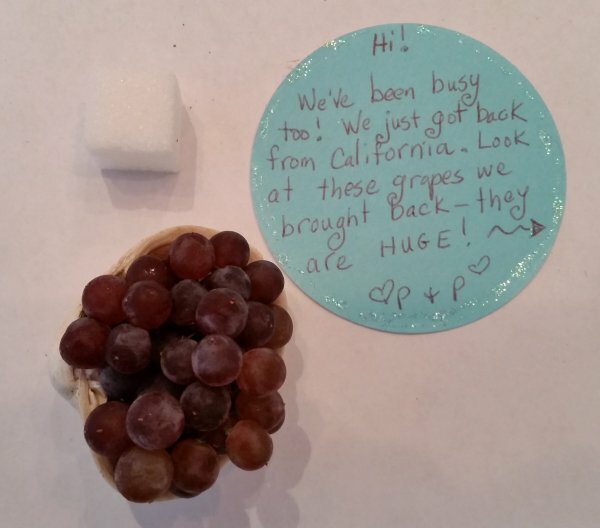 Someone gave us these teeny tiny little grapes. You can see by the first picture, just how small they are compared to a regular grape! They are called champagne grapes. They were super sweet – but a real pain in the patootie to eat! 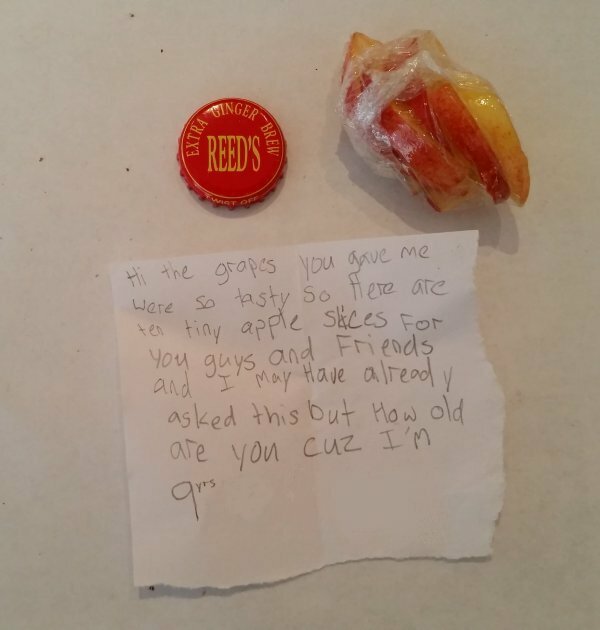 As we were sampling them – an AHA moment! 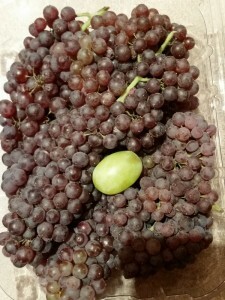 These are ‘fairy small’ grapes! The next morning, she had returned the kindness, with itsy-bitsy little pieces of apple on the same clam shell, wrapped very thoroughly in plastic wrap, so the spiders couldn’t get them! Her Mom told us a few days later that she ate a couple of grapes herself – shared TWO with her brother – and took the rest to school to show her friends. Here’s a pretty easy one. Not nearly as much serious crafting skills required as the Favorite Things book! Our little friend next door, asked what it was like to be a fairy. 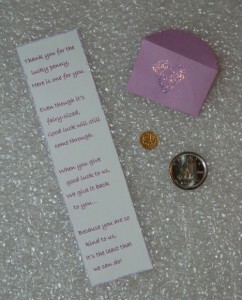 So Petal and Thorn left her this note, and two little treasures. 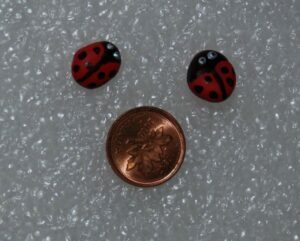 Teensy weensy lady bugs. All you need – is some teensy-weensy pebbles, as lady-bug shaped as you can find, a little red acrylic paint and a black sharpie. Paint the pebbles red. Then with your black sharpie make it look like a ladybug! For the eyes, I took a toothpick and put a tiny white dot of White-Out. After it dried, a tiny dot of black. When everything was fully dried, I put a coat of varnish on them. But some clear nail polish would do the trick too! I’ve seen a similar technique done – making upholstery tacks into little mushrooms. Give that a try too! 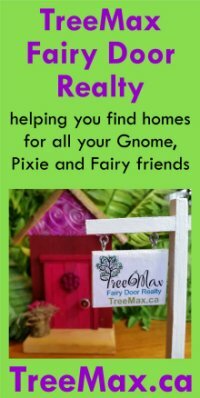 Another little project for your fairies to leave! 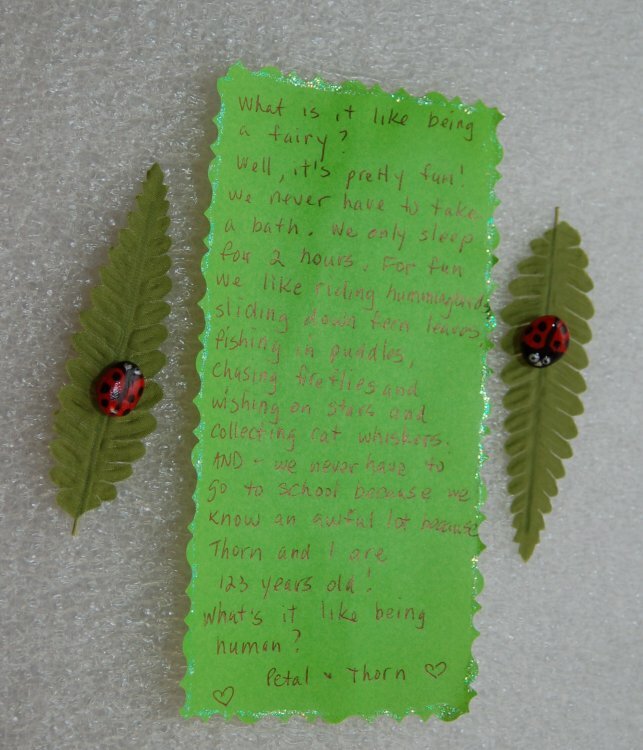 Our little neighbor asked Petal and Thorn what their favorite things were. 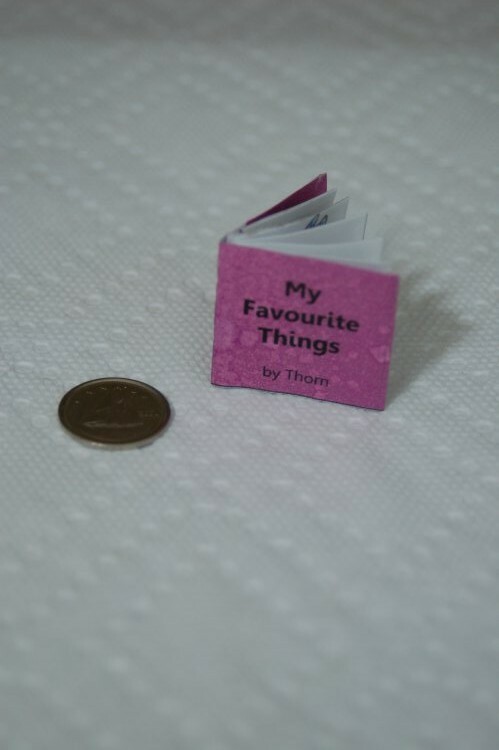 So Thorn (with a little help from me… well, mostly I did all the work) made a teeny tiny little book of favorite fairy things. I’ve included a PDF template of my book and some instructions, to help you create one of your own. I thought up ten things I was certain fairies would like. I made a small table in Microsoft Word that was 12 columns wide. The first column and the last column were half the width of the other 10 “pages”. Then I searched the web for little images of butterflies, lady bugs, flowers, dragonflies, etc. 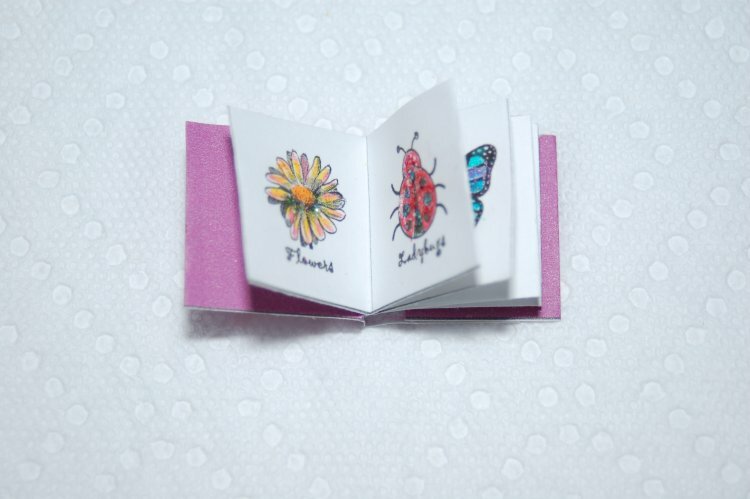 I shrunk them down until they fit nicely on my little “pages”. I took some pencil crayons and thoroughly enjoyed a little adult coloring-book time. (Oh, how I loved to color as a child…)* And, of course, adding a little fairy dust (stickles) wherever possible. Then, I cut around the outside borders of the template, folded the strip in an accordion fashion. 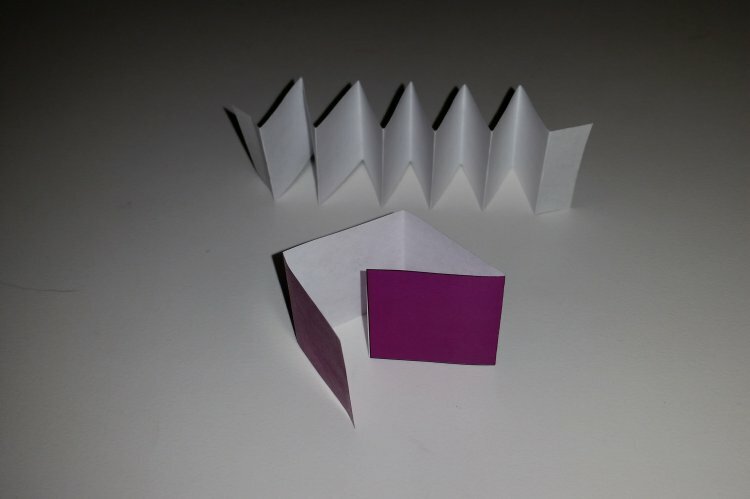 Then with a little glue stick on the backside of every other page, I closed all the pages up to make two-sided pages. 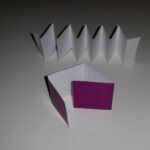 Now for the cover, fold the left side and the right side, inward to make the covers of the book a little thicker, insert the blank “leaflet” on either end inside the cover (tabs A & B on the template) with a little more glue. Voila! 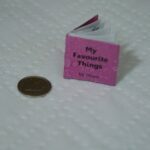 A Book of Favorite Things! * Just as an aside, it appears that adult coloring books have become the all new rage! Ooh, I have to get me one of those! I can’t even imagine what great stress-reliever that would be, to sit down and do a little coloring. If only I had a few more hours in the day…. Our little neighbor friend left the Fairies a lucky penny on the fairy doorstep one day. 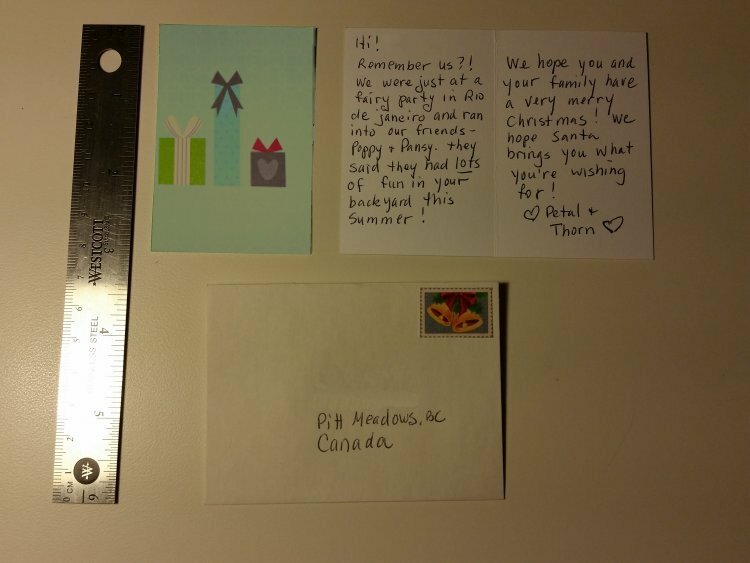 Here is what they left for her! 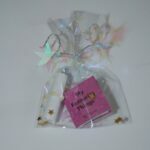 The Fairies also wrote a clever… (in the Fairies’ opinion) …little poem. And don’t forget the fairy dust. Fairies spread that sparkly stuff EVERYWHERE! I hope you’ve already read the story, one tab left, on “How it all Started”. 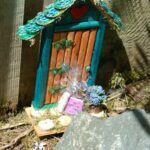 As promised, on this page, I’m going to share some of our Fairy Projects, Ideas and Inspirations with you, with a view to helping you create them yourself. No doubt some of you will improve on these Fairy Projects, too! I’m going to start off with a pretty simple one. This is great if you live somewhere where it rains a lot… Like our lovely city of Vancouver! Last summer we had one particularly rainy week. When the rain finally stopped, and the sun came back, Petal and Thorn left this on the fairy door step for our little neighbor. No special skills required! Just a cocktail drink umbrella and some glitter glue (I use Stickles, but there are a lot of other brands out there). 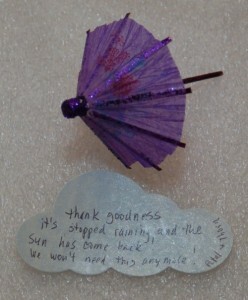 Spruce up the umbrella with a little sparkle – and anything else you might think of. That’s it. As an aside, I think that the Fairies have taken over a teeny tiny portion of my brain. I am always looking at things in a different way – what I can transform, that I might normally throw out, and thinking…. 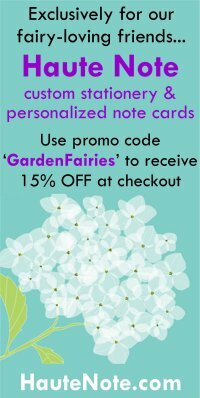 how can I fairy-ify these? 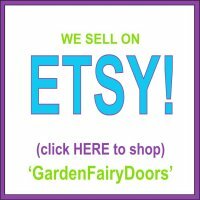 You’ll see as we go down this fairy path together, all the things that have been repurposed! 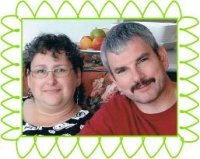 Over the coming days and weeks, we hope to use this Blog to document some of the projects we have done… for ourselves, friends, neighbors and their children! It explains what led us to start thinking and planning all these different Fairy games and projects.